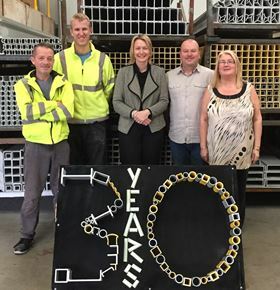 From left: Chris Foulkes, Sean Lumsden, Nicki Thelwall-Jones, Ian Middleton and Barbara Martin from Engineered Composites mark the company’s 30th anniversary. Engineered Composites has celebrated its 30-year anniversary. Specialising in sourcing and distributing glass reinforced plastic (GRP) products, Engineered Composites’ GRP products are an alternative to steel, aluminum and timber and are used for handrails, flooring, concrete reinforcement and fencing. ‘When Engineered Composites started out 30 years ago, we could only imagine where our goods would end up,’ said MD Nicki Thelwall-Jones. ‘Our products helped with the making of the sculptures for the Thames but one of our biggest orders was for 2,220 m of flooring for a Mercedes-Benz car park. Generally though, day to day, we’re more likely to support and find solutions for automotive, chemical, rail, water, construction, marine, manufacturing, transport infrastructure, telecommunications and electrical industries. ‘Looking ahead to the next 30 years, I see a material that will become increasingly used and more widely available – we may see a day where we can use 3D printing to produce them,’ she added. This story is reprinted from material from Engineered Composites, with editorial changes made by Materials Today. The views expressed in this article do not necessarily represent those of Elsevier. The paper submission deadline for The Fiber Society’s 2016 fall technical conference has been extended to 30 August. Molding company Arburg says that its Italian subsidiary has celebrated its 25th anniversary.